The main gym at the Alaska Airlines Center, flooded by the Nov. 30 earthquake, is off the disabled list and ready for action. 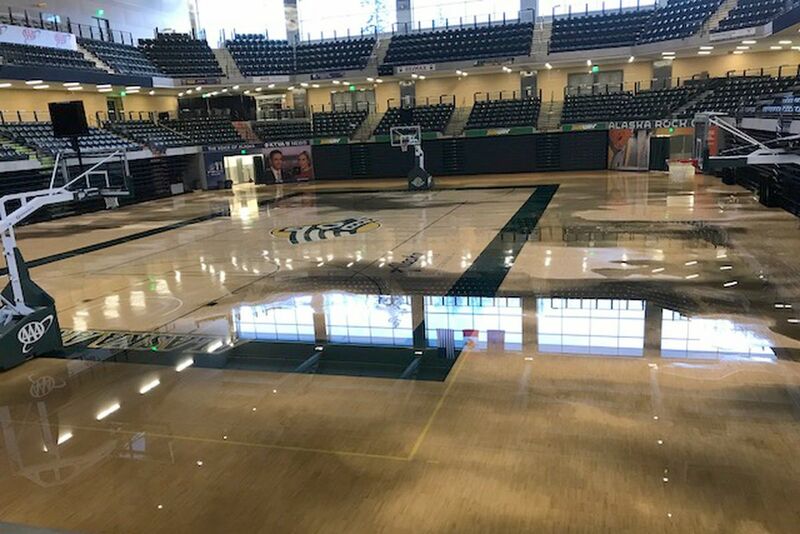 The UAA basketball teams will resume practicing at the gym after using off-campus gyms for a full week, UAA athletic director Greg Myford said on Friday. “The Alaska Airlines Center Box Office has reopened and the Gymnastics facility is back in use. Basketball teams will resume practicing on the main arena floor next week,” Myford said in an email. That’s good news not just for the Seawolves, but for others who use the main gym at the 4-year-old, $109 million arena. It means next week’s state high school wrestling championships can be held there as planned. Myford said there is no discernable damage to the arena’s main floor. Myford said two areas at the arena remained closed over the weekend as repairs continue — the auxiliary gym and the Varsity Grill restaurant -- but both are expected to open soon. The school’s other sports facility, the Wells Fargo Sports Complex, is fully functional, he said. Both UAA basketball teams practiced off-campus last week. The hockey team practiced at Sullivan Arena instead of the Wells Fargo earlier this week before leaving town for an extended road trip.